Spring Mountain’s status as part of the Clark County Juvenile Justice System and recent dominance in football and basketball has led to something of a movement to get the school pushed up and out of Class 1A. Richard Stephens/Special to the Pahrump Valley Times Senior pitcher Geo Maldonado delivers against Spring Mountain during Beatty's 17-7 win over the Golden Eagles on Friday in Beatty. Maldonado scored 6 runs as the Hornets swept a doubleheader. Richard Stephens/Special to Pahrump Valley Times Beatty junior Austin McKenzie drills a triple in the second inning Friday to score Jacob Henry and give the Hornets a 7-0 lead over Spring Mountain in Beatty. The Hornets went on to win 17-7. But this is spring, and, to paraphrase Tennyson, in the spring a young man’s fancy lightly turns to thoughts of beating the Golden Eagles at something. Beatty High School’s baseball team had no trouble doing that Friday, sweeping a doubleheader in convincing fashion. Junior infielder Austin McKenzie opened the scoring with a three-run double in the first inning and capped it with a home run in the sixth as the Hornets rolled to a 17-7 victory in the opener, and McKenzie followed that up with a 4-for-4 game with three RBIs to back five no-hit innings on the mound by junior Fabian Perez in an 8-4 win in the second game Friday at Keith K. Koerner Memorial Field. Perez might have surprised himself with his effort in the second game. He entered the first game in the fifth inning and walked three of his first five batters before settling down, but as a starter in the second game, he walked just two in five innings, striking out five while allowing one run. Perez also reached base six times in nine trips during the doubleheader, scoring four runs and hitting a double and a triple. That’s especially true with senior Jacob Henry and McKenzie batting the way they did Friday from the third and fourth spots in the batting order. “Austin McKenzie played the game of his life, two games of his life,” Verzilli said. “He’a three-year player, and his fielding is just phenomenal. He’s also really come a long way with his pitching, and his bat’s come alive. He’s finally getting good hip rotation, and he’s just nailing the ball. Henry finished 2-for-4 with 2 runs in the second game after a 3-for-4 day with 3 RBIs. 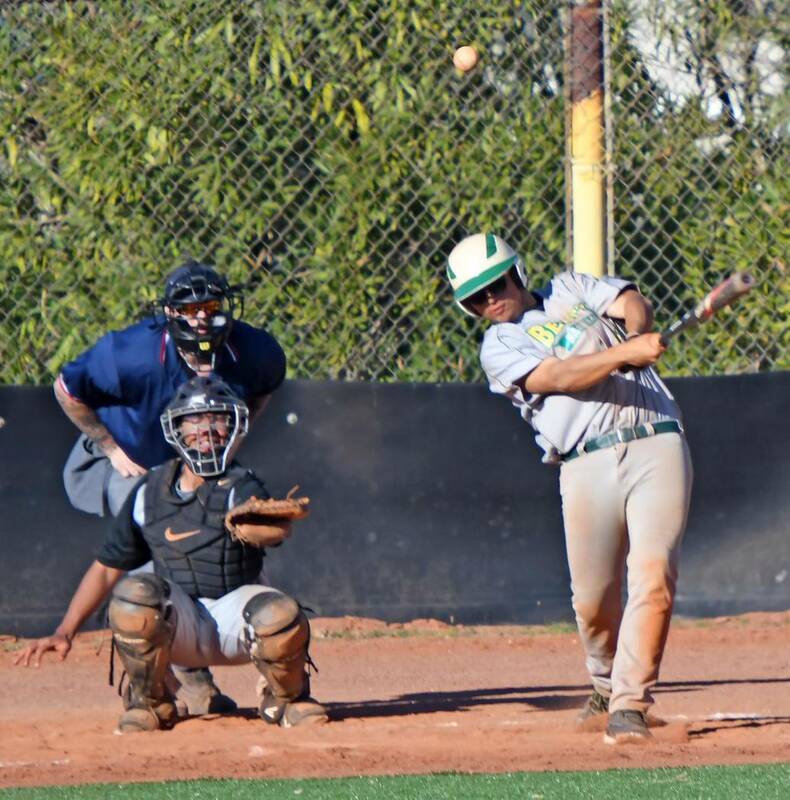 McKenzie drove in 7 runs in the first game, while the Hornets’ first four batters — Perez, senior Geo Maldonado, Henry and McKenzie — scored 3 runs apiece. Maldonado started the opener, striking out nine in four innings. The wins got the Hornets back on track after a disappointing doubleheader sweep at the hands of Beaver Dam. The Diamondbacks had rolled to 19-4 and 8-4 wins Tuesday. “Against Beaver Dam, it was just a total collapse of our pitching,” Verzilli said. But Friday marked the first Class 1A Central League games of the season, and the Hornets find themselves 2-0 in the league. 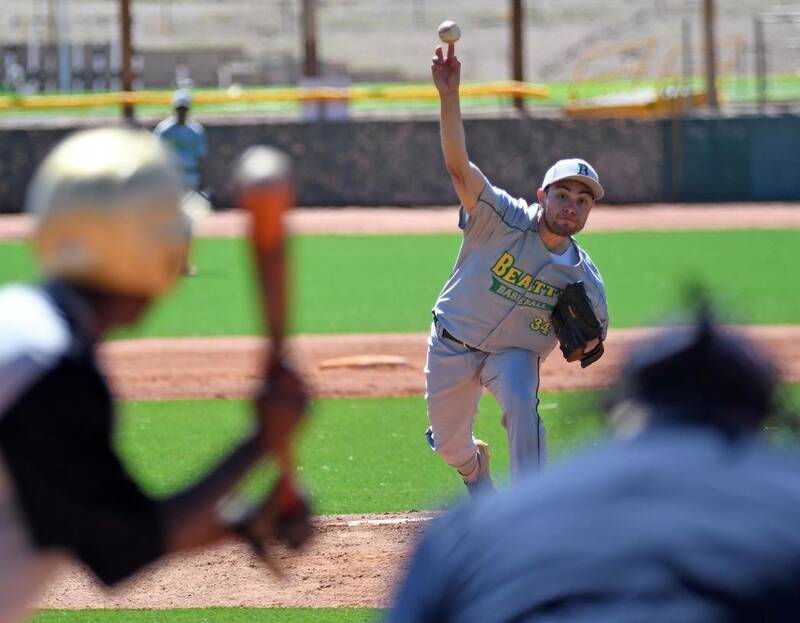 With two wins over the Golden Eagles and Green Valley Christian and Round Mountain struggling early, it might not be too early to point to Beatty and Tonopah as the league’s contenders. “I think we’ll be pretty good, better than last year,” Perez said. Junior Jose Granados won three events Wednesday to spark the Beatty High School boys track and field team to 51 points and a fifth-place finish at Pahrump Valley’s second weekday meet. The meet featured three Class 3A schools — Pahrump Valley, Somerset Academy Losee and Sunrise Mountain — and three Class 1A schools — Tonopah, Round Mountain and Beatty. The Hornets finished just five points behind the fourth-place Muckers. Granados captured two events in the distances, taking the 800 meters in 2 minutes, 7.0 seconds and the 1,600 meters in 4:51.0, and he also finished first in the long jump with a distance of 19 feet, 2 inches. Sophomore Noel Gutierrez won 300 hurdles in 46.2 and took third in 110 hurdles 18.6 for the Hornets. The Beatty girls also finished fifth but totaled just 14 points. Sophomore Carmen Stephenson finished third in the triple jump in a personal-best 26-3, while senior Angie Altman was right behind in fourth at 26-0, also a PR. The Hornets next are scheduled to compete in the Richard Lewis Invitational on Friday at Moapa Valley High School in Overton.